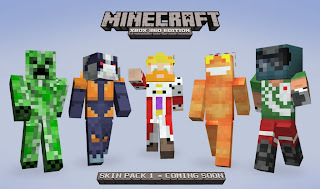 Minecraft: Xbox 360 Edition Title Update coming soon with Skins! Title Update 1.7.3 for Minecraft is set to arrive next and brings with it the new skins aside from the major update feature like pistons. There will be about 40 skins to buy, but you'll be able to check out each one before you make a purchase. You'll also be able to use the current skins in multiplayer for your single player Steve. The skins above shows some of the new skins including the creeper, a covenant grunt, splosion man, and I believe the king from castle crashers. Check out some screens of the new skins below!